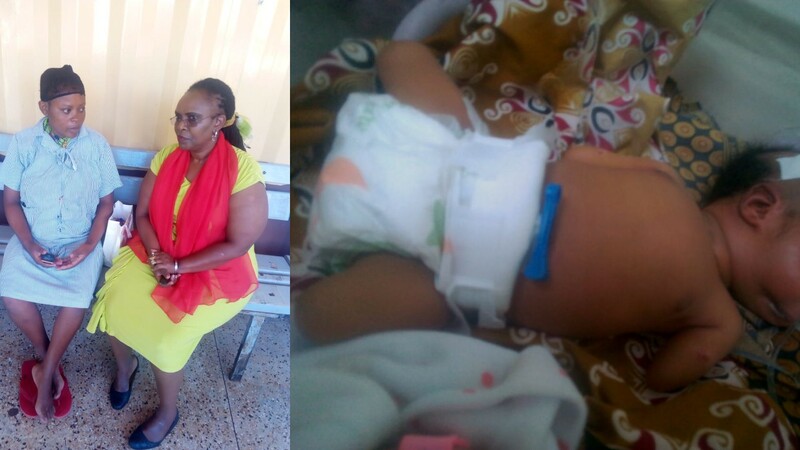 Home HEALTH NEWS Counsellor appeals for acceptance for child born with congenital amputation. Counsellor appeals for acceptance for child born with congenital amputation. Ms. Rosemary Njeri narrates her story to Psychologist Gladys Chania at Thika Level 5 Hospital. (RIGHT) Baby John Gachuhi who was born with congenital amputation at Igegania Hospital on Sunday. Renowned psychologist Gladys Chania has called on parents to accept and celebrate children born with various birth defects. Chania has also appealed to communities to also play a part by accepting and providing opportunities for these children instead of subjecting them and their parents to ridicule. While speaking at Thika Level 5 Hospital after visiting Ms. Rosemary Njeri, 32, who gave birth to a baby boy without part of his legs and hands, Chania acknowledged that such parents faced a lot of stigma and isolation which in turn affected their relationship with the rest of the society. Baby John Gachuhi was born on Sunday at Igegania Level 4 Hospital in Gatundu North sub-county and later transferred to Thika. Other than his defective limbs, the boy was also born without the chinbone. “Such parents face a lot of ridicule in the society something that affects the kids both socially and psychologically. I would like to encourage people to embrace such cases and be positive on such births,” she said. She was happy that the boy’s parents had accepted the situation and were very ready to take care of him just the same way they took care of his other four siblings. “The boy’s father is very supportive and is encouraging his wife to accept the situation as it is. They are both very ready to defend their son from any negative forces that comes his way,” she said. The father, 48-year old Stanley Githiinji is a casual labourer while the wife is just a peasant farmer in Mukuyu-ini village, Gatundu North. Other than the defects on his limbs and chin, doctors have passed a clean bill of health on the boy who was born at 3.2kg. Congenital amputation is a condition where a child is born without a limb or limbs, or without a part of a limb or limbs. It is known to be caused by blood clots forming in the fetus while in utero (vascular insult) and from amniotic band syndrome: fibrous bands of the amnion that constrict foetal limbs to such an extent that they fail to form or actually fall off due to missing blood supply. Congenital amputation can also occur due to maternal exposure to teratogens during pregnancy. In most of these such defects occur in the first three months of pregnancy when the organs of the fetus are beginning to form. 33-year old inspirational speaker Nick Vujicic was born with an extremely rare congenital disorder known as Phocomelia, which is characterised by the absence of legs and arms. Growing up in Melbourne, Australia, Nick struggled mentally, emotionally, and physically. Bullied at school, he attempted suicide when he was just 10 years old. Eventually coming to terms with his disability, Nick decided to become vocal about living with disabilities and finding hope and meaning in life. The charismatic Australian now travels the world addressing huge crowds. He has visited more than 57 countries and given over three thousand talks, some of which have attracted audiences as large as 110,000 people. Nick has also founded an international non-profit organisation and ministry, Life Without Limbs, through which he campaigns against bullying. Brimming with life, Nick loves to paint, swim, skydive, and surf. He has also published his memoir Love Without Limits, which is an international bestseller. Happily married to Kanae Miyahara, Nick is the proud father of two sons. Hero chief chase kidnapping suspects, save woman.